What is the Pre-Trial Diversion Program? The Pre-Trial Diversion is a diversion program which is offered to certain offenders who qualify for participation as an alternative to prosecution. Participants receive coordinated assistance in personal and group counseling, drug and alcohol rehabilitation and other community agencies appropriate to their needs. The program is designed to meet the needs of certain nonviolent offenders in an attempt to deter their future criminal or disorderly behavior; to minimize loss to victims of these crimes through payment of restitution by the offender; to serve the courts by reducing the number of less serious cases, permitting more time for the more serious crimes; and to protect the community by closely supervising the accused following arrest until final disposition of the case. What are the benefits of diversion? Pre-trial diversion is a cost-effective way of dealing with certain non-violent offenders. Not only does diversion lower costs, but it also reduces recidivism as many who go through diversion never commit a crime again. We are committed to keeping our community safe and secure. That is why we are also committed to diversion as a way to give non-violent offenders a second chance by requiring them to participate in intensive rehabilitative programs. This program makes our parishes safer and our community stronger. The individual must show a good faith willingness to participate in the program. Offenders meeting the criteria are referred to the program following a review of the pending charges by an Assistant District Attorney. The offender is interviewed and given an overview of the program on the day of their court date. The offender then makes a decision to participate in the program or go to court. The final decision as to the acceptability of the offender for the program is made by the Pre-Trial Coordinator. In order to help defray additional expenses in the application of the program services, a diversion fee is required, payable before the ending date of the diversion program. Each participant will meet with the Coordinator for individual meetings. Some participants may also be required to attend group meetings upon recommendations of the Coordinator. One goal of counseling will be to help the participant gain an awareness of the legal and social consequences of criminal behavior. The Coordinator will also assist the participant in any other problem areas. Referrals will be made to community agencies that can provide services relative to the participants’ needs. Also, community service with a minimum of 48 hours may be required at a nonprofit organization. Is participation mandatory and if not, what are the advantages to a defendant in choosing to participate? On certain charges, the participant who completes the program satisfactorily may request to petition the court for expungement of the arrest record. This can be done through a private attorney. How long does a participant remain in the program? Active participation may last from six month to two years. The exact duration of the program will depend on the seriousness of the offense, the attitude of the participant and how well the participant has met the goals of the program as determined by the Coordinator. What is required of a participant in order to complete the program successfully? Participants must attend all sessions and keep all other appointments that are mutually agreed upon by the participant and Coordinator. All participants must be employed or enrolled in school before they can be recommended for satisfactory termination. Restitution, if required, as well as Diversion fees must be paid in full before program completion. 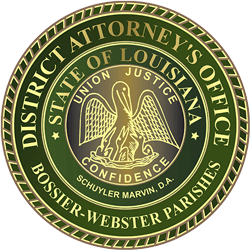 A subsequent arrest or violation of program rules will result in the participant’s case being returned to the prosecution section of the District Attorney’s Office for prosecution. What happens when a participant enters then completes the program? When a participant enters the program the pending charge is put on hold. When a participant completes the program satisfactorily, the pending charge is “Dead Filed”, conditioned upon the participant complying with the requirements of the Pre-Trial Diversion Program. Does the program provide any special services? Participants who are college students may, in certain cases, be referred to the university they are attending for supervision and counseling services. The program also has reciprocal agreements with other diversion programs and community agencies in other area.